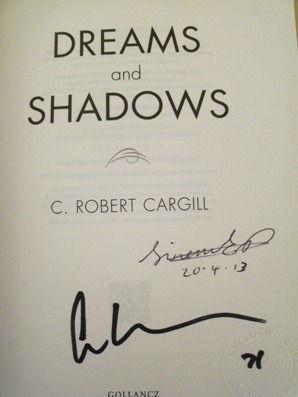 Signed and numbered by the author. Stamped with an embossed limitation stamp. Synopsis : In the debut novel DREAMS AND SHADOWS, screenwriter and noted film critic C. Robert Cargill takes us beyond the veil, through the lives of Ewan and Colby, young men whose spirits have been enmeshed with the otherworld from a young age. This brilliantly crafted narrative - part Neil Gaiman, part Guillermo Del Torro, part William Burroughs - follows the boys from their star-crossed adolescences to their haunted adulthoods. Cargill's tour-de-force takes us inside the Limestone Kingdom, a parallel universe where whisky-swilling genies and foul-mouthed wizards argue over the state of the metaphysical realm. Having left the spirit world and returned to the human world, Ewan and Colby discover that the creatures from this previous life have not forgotten them, and that fate can never be sidestepped. With sensitivity and hopeful examination, Cargill illuminates a supernatural culture that all too eerily resembles our own. Set in a richly imagined and constructed world, complete with its own richly detailed history and mythology, DREAMS AND SHADOWS is a deeply engaging story about two extraordinary boys becoming men..